The ambition is for centrally-located experts from Valmet to be able to guide local mechanics via connected video transmitters worn as glasses. With help from experts, mechanics in various countries across the globe can then perform complicated repairs on the company's tissue paper machines and implement preventive measures. Quick and simple for customers and suppliers. 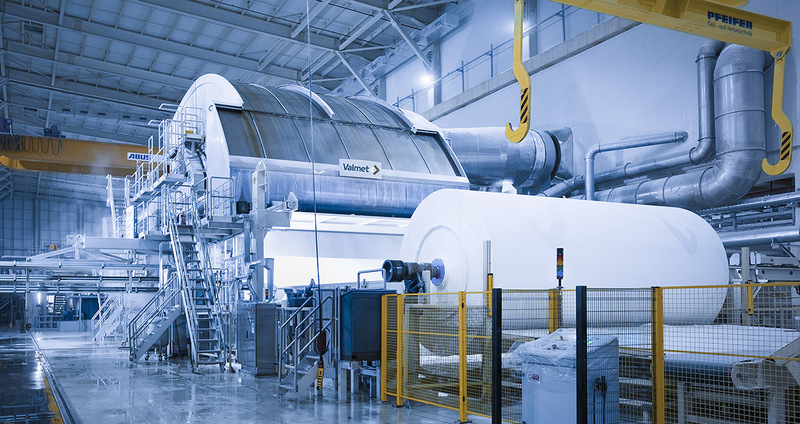 "We're not quite there yet," admits Gunnar Gullbrand, Global Tissue Services Director, responsible for the aftermarket at Valmet's plant in Karlstad, which manufactures tissue paper machines for the global market. "Then again, we are currently able to offer services to our customers via the internet which we were not even close to being able to do just a few years ago." Valmet is one of the leading players in terms of larger systems and supply 10-12 tissue paper machines to various countries each year. "The large, worldwide geographical spread was an important reason we began exploring possibilities to connect ourselves to our customers' machines," says Gunnar. The desire for quick feedback and better understanding of servicing needs and wear did not originate from their customers. It came from the company itself. "We often encountered strong opposition when we first started discussing these ideas with our customers. To understand the reasons for this, you need to understand our customers' positions. The industry is veiled in secrecy and each manufacturer has a proprietary recipe for their tissue paper so as to gain a competitive advantage. This means that transmitting information from machines via the internet to an external party may be construed as a risk. But attitudes are changing, and interest in connected machines is increasing. "Today, we supply complete machine lines and have better technology for exchanging process information. What this means in practice is that we gather and log operational data from the machines in order to ensure that they do not deviate from recommended levels and process parameters. Our experts in Karlstad analyse the values we receive and, based on the results, we recommend certain actions to be taken by the customer. Either on their own or with support from us." This service is primarily being offered with new machines, even though possibilities sometimes exist for customers to connect their existing machines. "We are evolving towards working more closely with customers – more like partners than just suppliers – because it is important for customers to be able to trust that we handle the data we collect in a confidential manner." Considering the initial scepticism shown by customers, security is naturally a central issue. This involves everything from encryption to firewalls and internal routines. These efforts must be carried out in full, as there is a lot to gain for both parties. "Try imagine what it would cost to send our best experts to Chile on short notice, compared with being able to solve the problem from home. The journey alone takes 24-25 hours with stopovers. We have come a long way, but we are eagerly anticipating the day our experts will be able to guide our customers remotely via connected glasses. This will take service and training to new heights." The Finnish company Valmet has an annual turnover of more than SEK 20 billion and has 12,000 employees across the globe in myriad operations. Karlstad is home to 560 of the company's employees, where tissue paper machines are developed, sold and supplied along with associated equipment. Karlstad also boasts a full pilot plant where customers can view various machine configurations and processes and train with these. Tissue paper is an absorbent paper which is used as toilet paper, serviettes, tissues and much more. Gunnar Gullbrand and the Boy from Bangladesh. "At a trade fair in Barcelona we were approached by a young boy – only 12 years old. We turned to speak to his father who explained that it was his son who was the company CEO. The boy sat down at a table with our sales reps and we noticed that he was remarkably intelligent and asked all the right questions. It turned out that this 12-year old wanted to establish his own tissue factory to produce tissue paper. Unfortunately, we were unable to accommodate him at that time, as he wanted to have a fully automated plant, which does not currently exist. But I often think about him when we make technological progress – that he had an interesting idea and that we may, one day, be able to do business with him."